The hard work and commitment of a great many people has paid off and the Lake District World Heritage site now joins other renowned UNESCO World Heritage Sites such as the Galapagos Islands in Ecuador, Uluru (Ayers Rock) in Australia, Mount Teide in Tenerife and the Rocky Mountains in Canada. 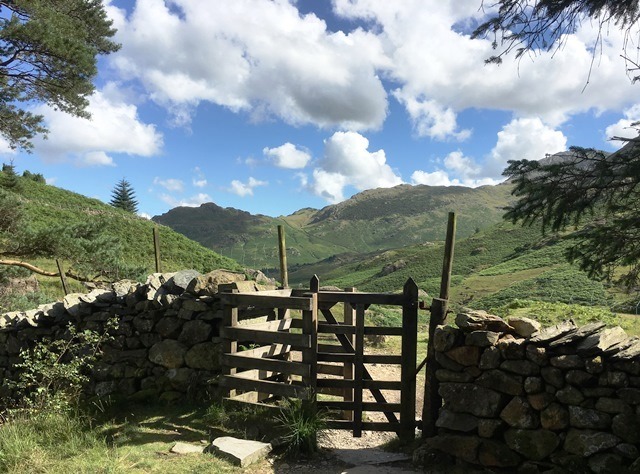 If you’re a regular reader of this blog, you will know how much I love the Lake District and also visiting World Heritage Sites, so to have this on my doorstep is VERY special. You can read more about the Lake District World Heritage site here. A few days after the result was announced I went to stay in the very heart of Lakeland, in the Langdale Valley. Here are some of its highlights. The Langdale Valley includes some of the most impressive mountains (called ‘fells’ in the Lakes) in England. These craggy peaks provide a dramatic backdrop to an area where man, beast and nature live together in relative harmony. 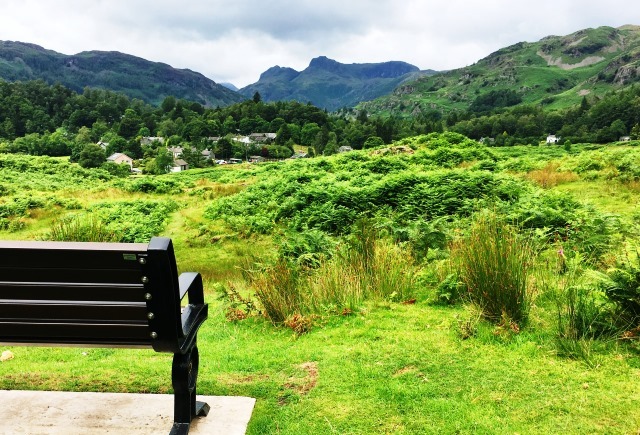 Langdale means ‘Long Valley’ in Old Norse, a hint to the ancient history of this quarrying and farming area. Very often the fells are shrouded in mist in this valley, adding to its moody magnificence. Dry stone walls ribbon across the mountain sides, sheep meander willy-nilly and picturesque farm buildings create its architectural charm. The peaks of Crinkle Crags, Pike o’ Bisco and the jagged ridge of the Langdale Pikes are the grand masters of this landscape. 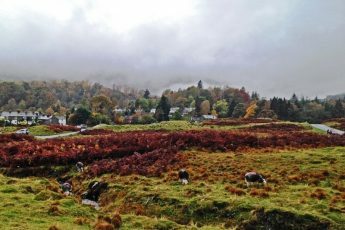 The village of Elterwater (meaning Swan Lake) spreads out across valley, vying for space with the Herdwick sheep which wander its lanes and graze on the Common. An easy stroll takes the walker to Elterwater tarn; good flat path but can get very muddy if it’s been raining recently. The Britannia Inn is the hub of the village, serving excellent ales, an interesting choice of wines and superb food. There’s also a cafe and a bus stop, a couple of hotels, a large time-share property and plenty of self-catering cottages for all the visitors who come to stay here. Good Life Lake District Cottages has their main office here, housed in a quaint stone building which usually has a Herdy wandering about outside the door. 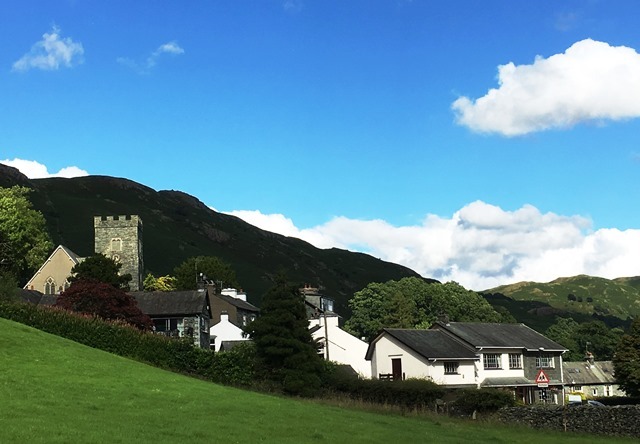 The Langdale Rambler (Bus 516) stops on the main road through Chapel Stile, dropping off visitors and locals in this tiny hamlet. A narrow lane of old quarrymen’s cottages wends it way up twards Silver Howe. The 19th c Parish Church of Holy Trinity was built on the site of the original chapel, in the local green slate which has been quarried here for centuries. Chapel Stile is well-served by the excellent Langdale Co-Op. This shop sells absolutely everything you could wish for, whether you’re camping, self-catering or out for the day. Tasty Cumberland sausages, Hawkshead Relish (I can highly recommend their Black Garlic Ketchup! ), micro-brewery beer, tent pegs, wet-weather gear, fridge magnets, tea towels and oh so much more. Upstairs in Brambles Cafe, gossip is exchanged and walkers rest their feet whilst having a cuppa or more hearty meal. Every year they hold the Langdale Gala here, a classic Lake District show with Cumberland Wrestling, fell races and dog show. Towards the end of the valley lies the Old Dungeon Ghyll, one of the most famous pubs in the Lake District. 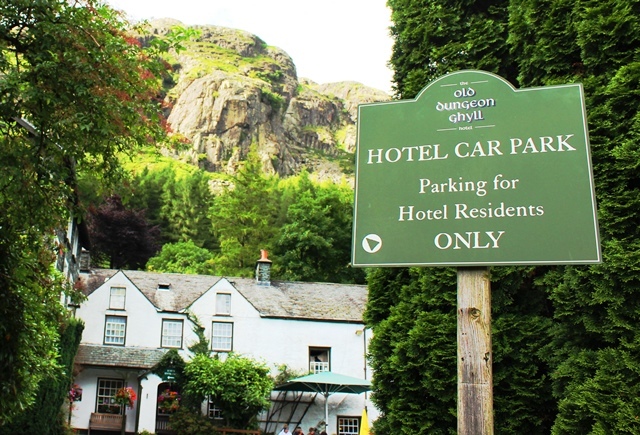 Tucked right up against the mountain side, this venerable old hotel was the meeting place for climbing clubs from around the country, drawn by the challenging peaks outside the door. I love the Hiker’s Bar, which has remained unchanged for decades and features the original cow stalls and stone floors. You can get a great pint, a coffee, lunch, dinner and if you’re lucky with the weather, sit outside and enjoy the scenery. From the Old Dungeon Ghyll the road winds up towards Blea Tarn and into the charming Little Langdale Valley. Driving up here takes nerves and good brakes as the road has some steep, sharp twists and is very narrow. Kamikaze Herdwicks wander out in front of the car and the view is most distracting. There’s a National Trust car park for Blea Tarn (tarn = little lake); it’s a Site of Special Scientific Interest, with brown pike in the water, alpine flowers in spring and tiny orchids in summer. However, it’s the view of the Pike o’Bisco and the Langdale Pikes laid out for your delectation that tops all that. I’ve walked here a few times but Blea Tarn has never looked as lovely as it did that July afternoon with marshmallow-soft clouds reflected in the shallow water and sunlight flittering across the peaks. 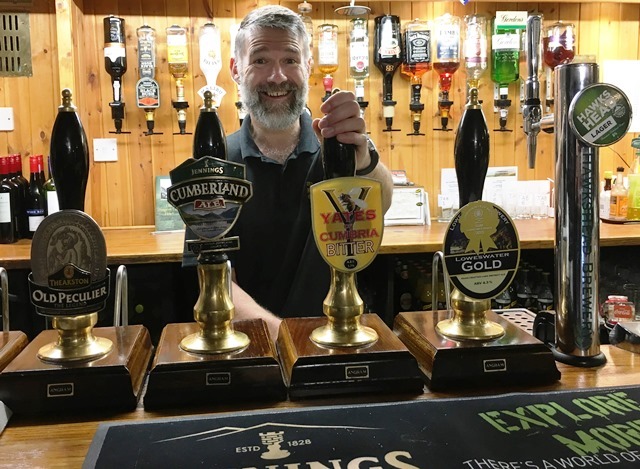 Voted Cumbria Tourism’s Pub of the Year 2017, the Three Shires Inn is at the conjunction of the three old counties of Cumberland, Westmorland and Lancashire, now bundled together as Cumbria. It’s a pretty pub with decent food and lively atmosphere, though limited parking which meant on this recent visit I had to give it a miss. The road heads off towards the twin passes of Wrynose and HardKnott; not for the faint-hearted. 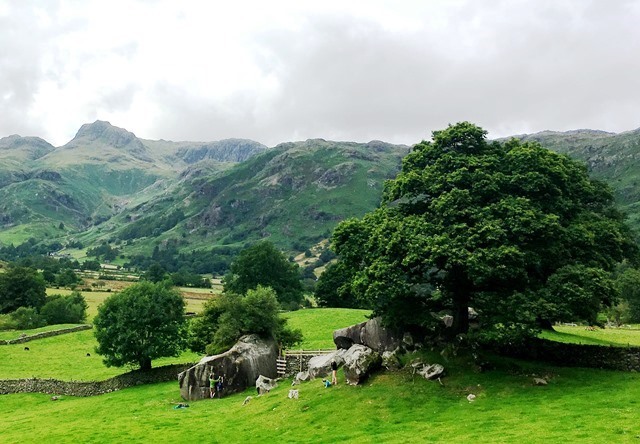 A short walk brings you to one of the most photographed sights in the Langdales, Slaters Bridge, an old pack-horse bridge and also enormous Cathedral Cave. I stayed in Chapel Stile with Good Life Lake District Cottages in a charming holiday home called Church Gate. Tastefully restored and attractively decorated, it sleeps four people in two bedrooms. The kitchen has a large fridge-freezer, dishwasher and large oven. A cup of tea tastes so much better in one of the cute Herdy mugs. There are games and books in the dining area and a wood-burning stove for cosy nights in. The back door leads out to a sheltered little cottage garden, ideal for evening drinks outdoors. Impressive views can be seen from the bedrooms across the village towards the mountains. I slept really well in the very comfy double bed and on Sunday morning woke to the sound of church bells and sheep bleating in the field opposite – perfect. More details and how to book Church Gate cottage here. 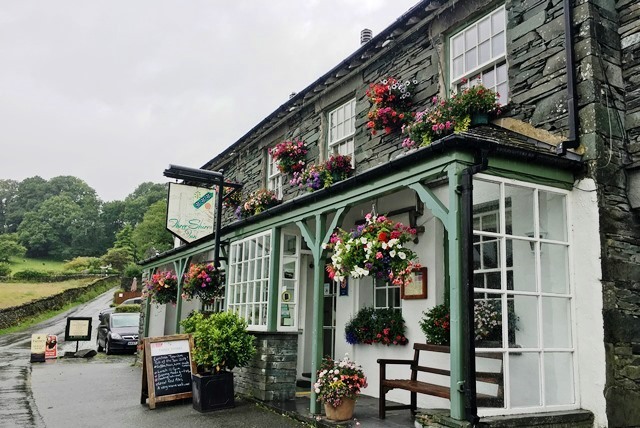 With the village shop just down the hill and a pub, Wainwrights Inn, five minutes’ walk away, Church Gate is an ideal place to stay and enjoy the Lake District World Heritage site. Many thanks to Natalie and the team at Good Life Lake District Cottages for another very enjoyable weekend. More lovely places I’ve stayed in and around the Langdale Valley. Beech Hill Hotel on Lake Windermere - the epitome of quirky! Of course I am totally biased, but really, the Lake District is a unique place and being awarded World Heritage status brings it much-deserved international recognition. Some people have voiced concerns about the increase in visitors; there will hopefully be measures put in place should that be the case. (They could ban the big coaches from the smaller roads which cause some serious tail-backs in summer.) My advice to tourists; visit off-season when the Lake District is quieter and you can appreciate its scenery in relative peace. I am certainly a country girl at heart. We love our urban Kendal hostel but like to get out of town as much as possible and head to the Langdales for some quiet reflective time. Come and stay with us at the Kendal Hostel if you’re in the area – the Langdale valley is not far away. Your photographs are so charming! 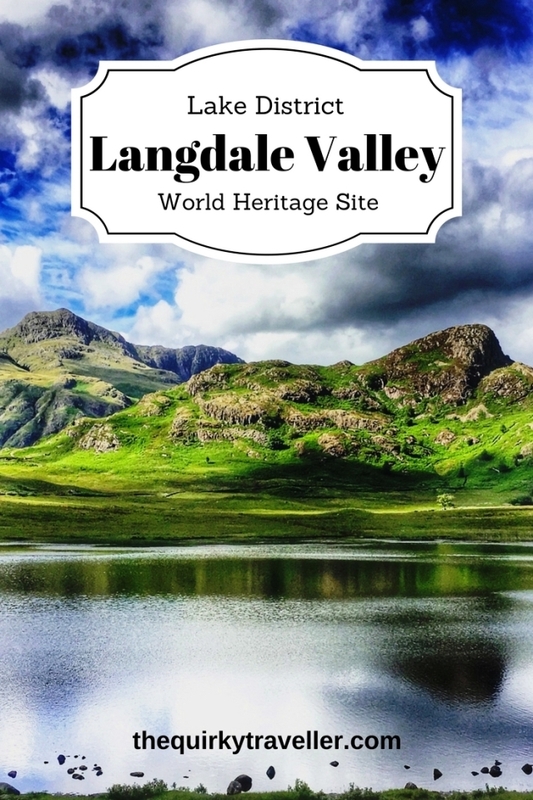 I’d love to explore Langdale valley. Looks so beautiful! There are so many great places in your article that I have been to and agree they are fab and so many more that I haven’t ticked off yet. Also, I keep meaning to get myself a bottle of that garlic ketchup! Not only is the landscape beautiful in its own right but it’s worth remembering that part of the reason the Lake District got World Heritage status is because the stunning views, lakes, fells, valleys and natural wildlife and flora have inspired some of the greatest artists, writers and thinkers in the world. When people visit some of the places in your article, hopefully they’ll leave feeling refreshed and inspired. For some cultural inspiration of what to do when you’re in the Lakes check out http://www.lakesculture.co.uk (sorry for the self-plug). 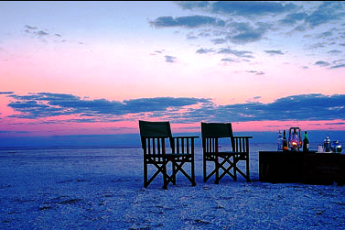 Oh we must come back and stay now! Congratulations to the Lake District – very well deserved. Do hope you come back very soon. Check out the link to Church Gate Cottage – there are plenty of other options there too. It’s wonderful to be able to stay right in the centre of the Lakes and have all that beauty on your doorstep. Do hope you return soon James. Good Life Cottages are really comfortable and ideally situated to explore the Lakes ? I too am immeasurably proud of the World Heritage status afforded to us earlier this year and from this piece it’s easy to see why we won it! The Lake District has so many layers of history and culture wrapped up in world class landscape, when reading about it it’s easy to forget I actually live here. I think having that external view or stamp of approval can help us view our own localities with fresh eyes and maybe even more positively. Thanks for a beautiful article about a beautiful area and re-opening my eyes to where I live. So agree with your comments Sophia. It’s easy to forget just what an exceptional area this is and to have achieved such an outstanding accolade is very special indeed. It’s a privilege and an honour to live here in the Lake District. Reading your blog I am reminded about all the wonderful places right here on my doorstep. Whilst there are some issues to be resolved (or at the very least communicated to us if plans to resolve them are already in place) receiving WHS is the icing on what is already a pretty phenomenal little corner of the world. 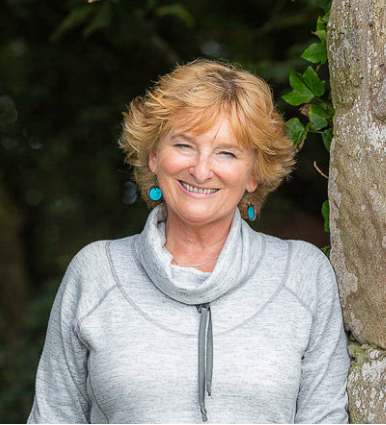 Well said Janett 🙂 It’s not all wine and roses winning such prestigious recognition; the potential increase in visitors and maintenance of the area will all have to be managed carefully. 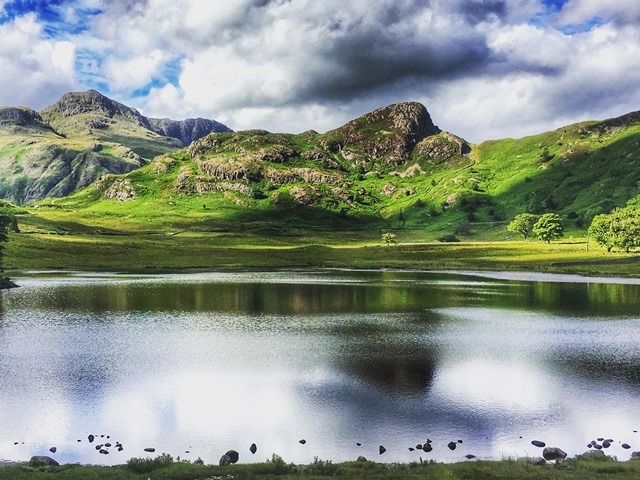 After reading all about the Langdales, we really wanted to experience it! We have been staying in beautiful Rose Cottage, which is one of The Good Life’s cottages and it has been so cosy and comfortable. It’s been wonderful to stay right in the centre of Elterwater, to wake up to the lovely views and to know that after a day exploring the delights of the well deserved award of World Heritage Site, we can walk a few metres to the Britannia Inn and then adjourn to the crackling fireside. I would thoroughly recommend it! So glad you enjoyed your stay in Elterwater. 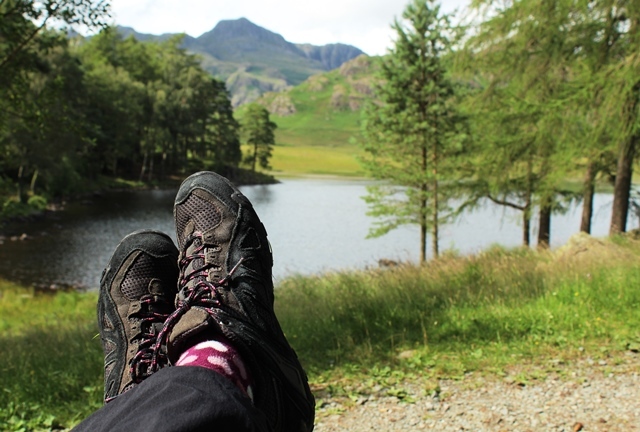 It’s the ideal location to explore the beauty of the Langdales and further afield in the Lake District. Hope you come back one day to see more!